Superman returns with the Fortress of Solitude (the tesseract version) and is attacked by the TDI. He stops their attack, but the mountain is hit. The Predators go into the Fortress and immediately hack up Kelex and cause trouble. Batman and Lois go into the Fortress. Superman comes in after putting Alien eggs in the cargo hold of the Predator ship and teleporting the Predator ship into his Fortress. Superman stops the Predators, and finds Kelex. A big alien attacks the Predators. Batman fights the Predators to a standstill with an injection of sedative. Superman's robot talks to the TDI and gets an hour before they nuke the volcano. Batman and Lois are ambushed by the large alien. Superman arrives to revive Lois, but Batman remains missing. The Predators shout about something as their ship repairs. Superman finds Batman after a prolonged tour through his Fortress. He's cocooned by the alien. He escapes, tries to sedate the alien, and the needle breaks. Superman takes the sedative and breaks it in the alien's throat, taking it out. The Predators attack the Superman robot. Superman arrives, and knocks them out with KO gas. Superman has Batman plot the ship a course for Arcturus and then eject in space, freeing the Predators. Batman falls to Earth, and Superman catches him. The TDI nukes the volcano anyway, and Superman and Batman walk away while Lois jokes. Story - 1: Still abysmal, just like the last issue. The TDI is ridiculous, as is their supposed nuclear jurisdiction over anything. Far-fetched and silly. 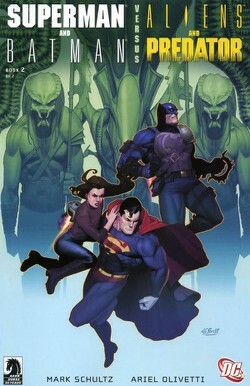 Superman again makes poor decisions, putting Lois and Batman in an enclosed space with Predators. The Predators predictably run rampant in his Fortress, but it seems a surprise to all involved. Lois, girl reporter, can apparently cobble together tesseract tech to fly around. Convenient. There's a ton of extraneous story, like Clark touring his Fortress with Lois in the middle of a crisis, an alien attacking Superman when he can't be harmed (interesting, but in no way relevant to the story). This extraneous story is put in place of, say, a fight with Aliens and Predators, which is sacrificed for... yeah, knockout gas. Three times they use knockout gas on these guys. The Predators have a full page of speaking with no translation. It's a completely wasted page, because no discernable action takes place beyond the ship being worked on, which is irrelevant to what the Predators are saying. Batman schools Superman about his lack of powers... in his own tesseract. Superman essentially unleashes a ship full of murderers on the galaxy instead of trying to reign them in somehow. This is Superman, not Jean-Luc Picard with a Prime Directive. And even Picard stops the Borg. He has them TRAPPED in a tesseract, and he lets them go. The giant alien just lets Batman live for a while, and outright lets Lois go. Convenient as all hell. In the end, they all share a good laugh while a NUCLEAR WEAPON goes off in the background. Superman doesn't do anything to contain it, and they're all in the area of immediate radiation fallout. Hah hah hah hah! Eh. I got screwed. Art - 4: Pretty good, for the most part. I wish this artist had been given a better story. There were a few funky things, like Superman making his heat vision go in a left and right arc at the same time without being a spread. It's like he had to anti-cross his eyes, which just looks funky on the page when you could just use a beam. Cover Art - 3: Painted, yes, and neat, but not entirely that captivating. It's kind of action-oriented, but it doesn't really pull you in that much. You wonder what they're looking at, and why it isn't on the cover.